This entry was posted in Science and tagged Richter Scale. Bookmark the permalink. Tom: is that really your house? We were at our condo in Palm Springs and we were closer to the quake than youn are. We had some minor issues butr not as much as you… Your blogs are great to read! 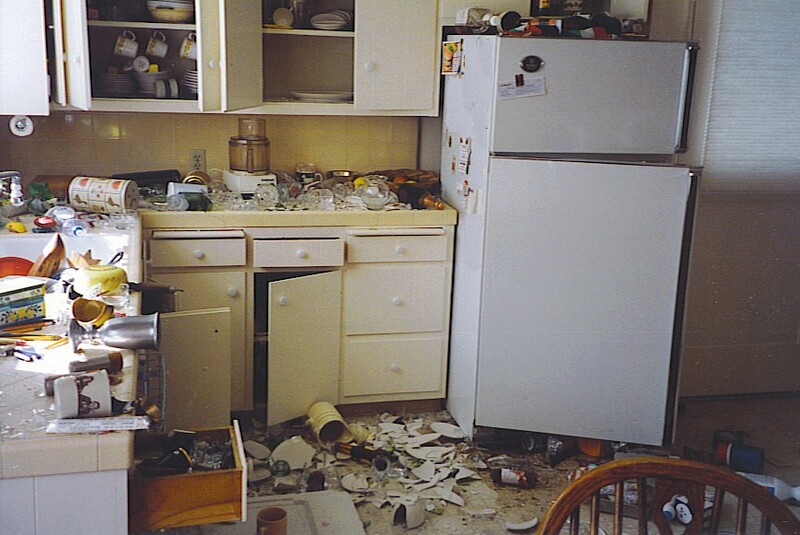 Our kitchen looked like that after a party one night. We didn’t invite those people back. I was in L.A. during the big quake of 1933. I was driving my Model A Ford, which at over 35 miles an hour provided the equivalent of a continuing 9.6 temblor. I didn’t feel a thing. Thanks for your witty essays. The numbers seem meaningless while going through a Big One as it’s impossible to imagine anything worse at the time. Almost like trying to comprehend the distances between galaxies. The Richter Scale is impossible to figure out. However I’m pretty sure that the distance between two galaxies is three blocks. Glad to help. Pretty nice post. I just stumbled upon your weblog and wanted to say that I’ve really enjoyed surfing around your weblog posts. In any case I will be subscribing to your feed and I am hoping you write again soon!